Six In The Country: Smashing Substitute! Sometimes the beauty of my home takes a back seat to frugality. Case in point is the fact that nearly a year ago, we upgraded our bed from a full size to a king size. Ohh, let me tell ya, memory foam ROCKS! OK, so in the last, oh 11 or so months, DH and I have used two different blankets, because we did not have a king size, and I kept waiting to find a good deal. So, after a year of half hearted attempts, we were Christmas shopping in Target and found the most beautiful comforter. We both fell in love with it, since it was in my aqua blue/chocolate brown scheme and not too girly. But, we decided that it could wait until the beginning of the year, because $172.99 was just too far a reach with all the holiday hullabaloo. We truly intended on purchasing it though, because we both liked it so much. Then......my frugal fairy was with me yesterday! 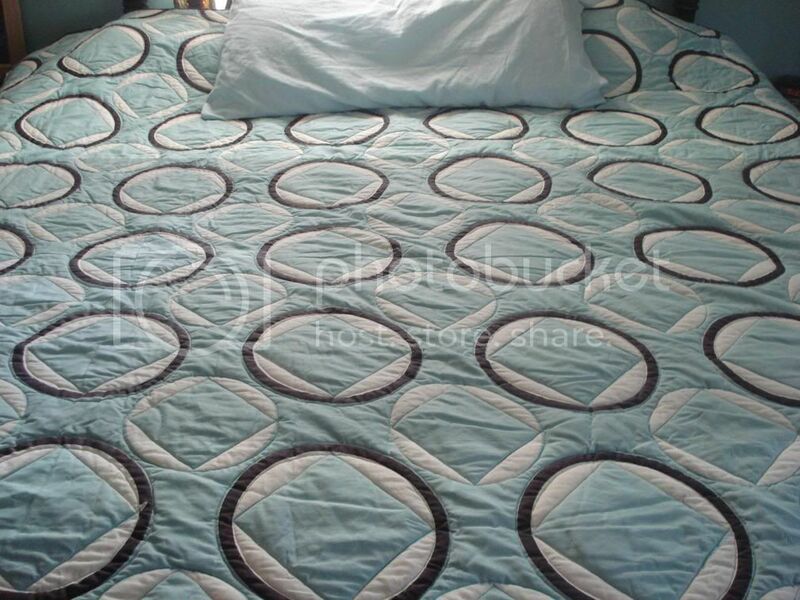 While I was out cruising the clearance sales, I found this beautiful quilt. It was originally $99.99, marked down to $59.99, and had a 50% off lowest price sticker on it. So I got this for $29.99 -- Saving myself almost $150 (once you count the extra tax I would have paid on the higher one.) The colors are the same, but the pattern different, yet still very pretty, and again, not too girly. OH! And, while I was there, I got all of the wrapping paper, a 2-pack in the perfect colors to match my living room, for .75 a pack, so less than .38 a roll. Not too bad of a deal, considering that I paid .66 a roll for it this year. I bought 6 packs (12 rolls) so one less thing I have to buy. Other good deals I found included 75% off on toys at Target (I have a good jump on next year's presents already), and some cute summer clothes for me at Kohls (where I spent $14 and saved nearly $150 off "retail" prices). Bring on warm weather, cause I got the cutest pair of pink and black flip flops that I have EVER seen! I just love a good bargain, can't ya tell? What good finds did you find on the After Christmas Clearance Sales? Ohhh Ohhh Ohhh I wanna see a picture of the flip flops please!!!! 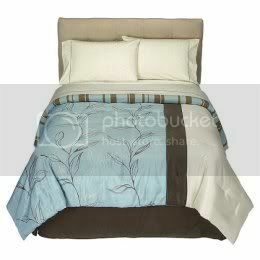 Dh and I sleep with two blankets also but it is because were both blanket hogs LOL Beautiful new quilt for your bed!